Profound and human messages on the ceiling. As I gazed up at the rafters of the restaurant/cafe/bar, I closed my eyes and slipped into a sensual appreciation of all that was happening at the moment. The coolness of the air on my sweaty clothes and skin. The notes of rock and roll drifting into my ears. The aroma of food cooking in a back room. The sight of every flat surface, except for the countertop and the seats, covered with colorful notes, drawings, quotes, and messages. 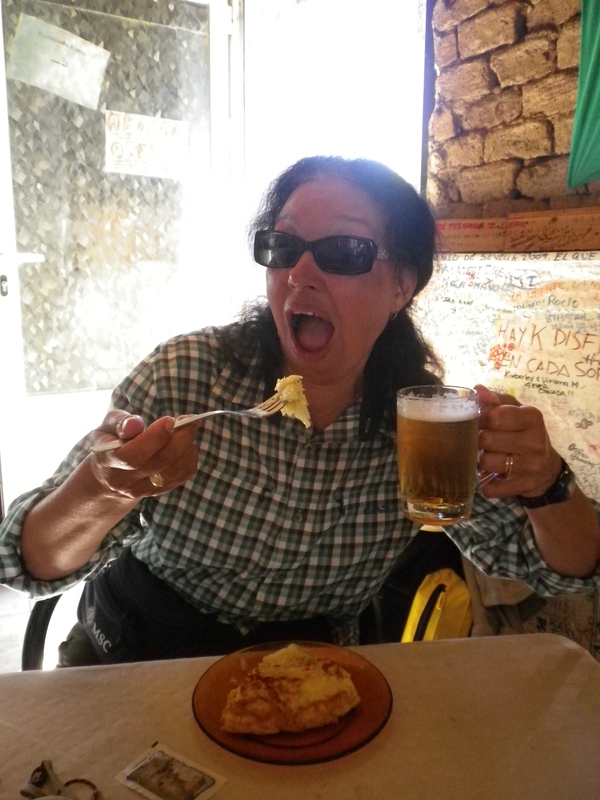 And, especially, the amazing assault on my tongue as I sampled the most perfect food I had yet tasted on the Camino. The town government has set up a gathering place in town. I was still traveling along a flat, dry and mostly treeless section of the Camino. 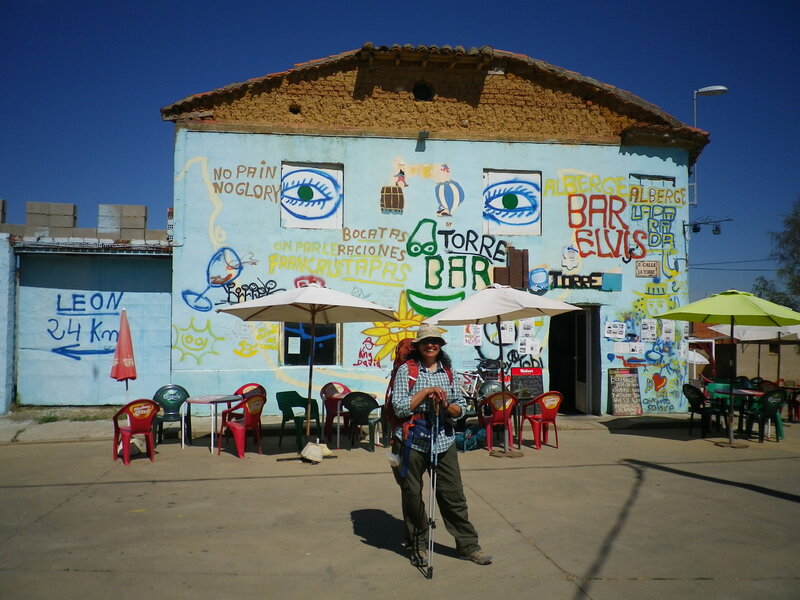 The few buildings were whitewashed and the Camino was dry stone, so the light reflected made sunglasses a necessity. I didn’t trust my intuition that my wet Camino was finally coming to an end and so I still had not unzipped my pant legs down to shorts. My decision two days earlier to not take the recommended route meant that it would be about 18 kilometers to the next albergue. Nevertheless, it was shorter than the other route and I was happy with my choice. As usual, I had been among the last to leave the albergue, although there had been people still eating breakfast when I left. I had decided to leave the sandwiches given to me at the convent for the next hungry and penniless pilgrim . 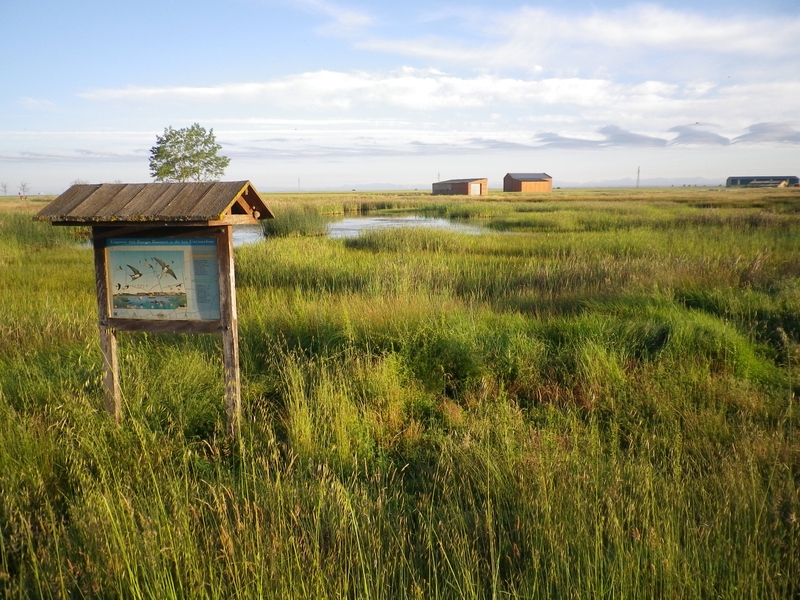 The marsh becomes more silent every year. Andres and Carlos had been in the albergue with me the night before, so we were all heading in the same direction. 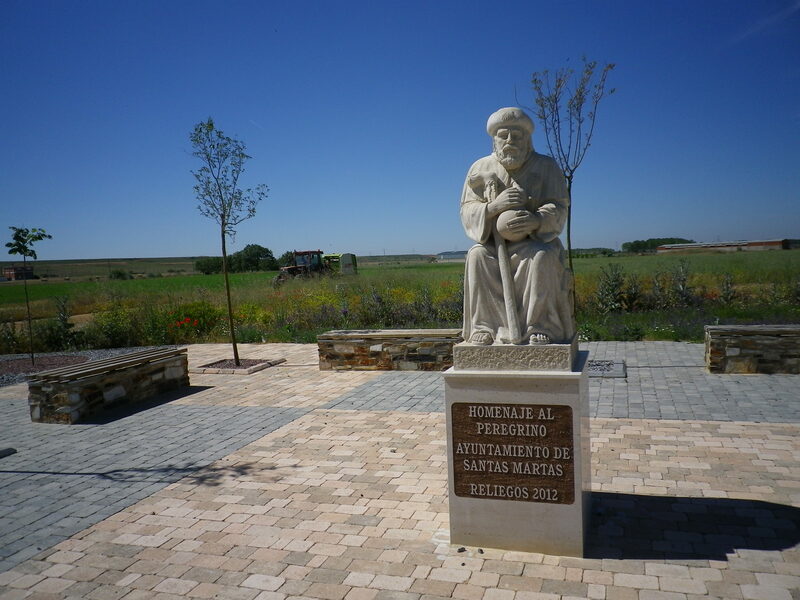 I asked what a “Burgo Ranero” – the name of the village – was and they explained. “Burgo” was basically just a word for village, hamlet. “Ranero,” however, was the name of the tiny little frog that we had been hearing all along our walk as we passed the canals and causeways. They were becoming rarer and the marshy lands were becoming quieter. I remembered the sounds that had enchanted me as I had walked along the canal on the way to Fromista and realized I had been hearing these tiny native frogs. The boys (Carlos and Andres) caught up with me kilometers later as I walked into the village of Reliegos. They had fallen in with one of their friends, a college student named Lizzie, and they were carrying on a conversation in Spanish about the conquest of South America. Carlos suddenly stopped our little troop and insisted that we zig where we had planned to zag. He wanted to take us to a bar he remembered. The town looked dead to me, no people, no dogs, no cars, no nothing except white heat, but I was game for his suggestion. We turned a corner and WOW! Who had the vision to put this . . . vision . . . in the middle of this town? Not graffiti, this place had been planned like this. A personal statement of the owner’s take on life, family, humanity, it was there for all to see. Of course, it was an irresistible invitation to enter. I didn’t know it, but the best was awaiting me inside. Too late and too sweaty for coffee, my breakfast that day would be ice-cold beer and a croissant. But Carlos suggested I try a piece of Sinin’s tortilla, instead. Tortilla had become my go-to lunch. Tasty, cheap and always present, it had become a no brainer. For those “NorteAmericanos” who may not be familiar with the difference between a Spanish tortilla and a Mexican tortilla, let me explain. They are as different as chocolate cake is from meatballs. The only thing they have in common is that they are round. A Mexican tortilla is a type of flatbread made from water and flour (basically), flattened, baked or pan-fried, and then used like a piece of bread to hold tacos, tostados, etc. A Spanish tortilla is like an omlette. If you have ever made a Bisquik impossible pie (do I need a copyright symbol?) you have the idea. It’s simple ingredients are potatoes, onions, and eggs. It is cooked in a skillet on the stove and flipped when it is done on one side. Sinin and a tortilla fresh from the back room. I wasn’t crazy about getting as huge a piece of Sinin’s tortilla as Carlos had gotten for himself, but my stomach drove me to try a bite as he insisted. That’s when I had the out-of-body experience. I went through the forkful I had of Carlos’ tortilla, then another. I ate, trying to decipher what the secret technique or ingredient was that made this tortilla far above all I had eaten on the Camino. Lizzie and Andres joined Carlos and myself in trying to break down what we were enjoying and we came up with many ideas but none that stood the test of time. I ordered my own piece of tortilla. I was like an alcoholic at a wine tasting. I gazed around the room. 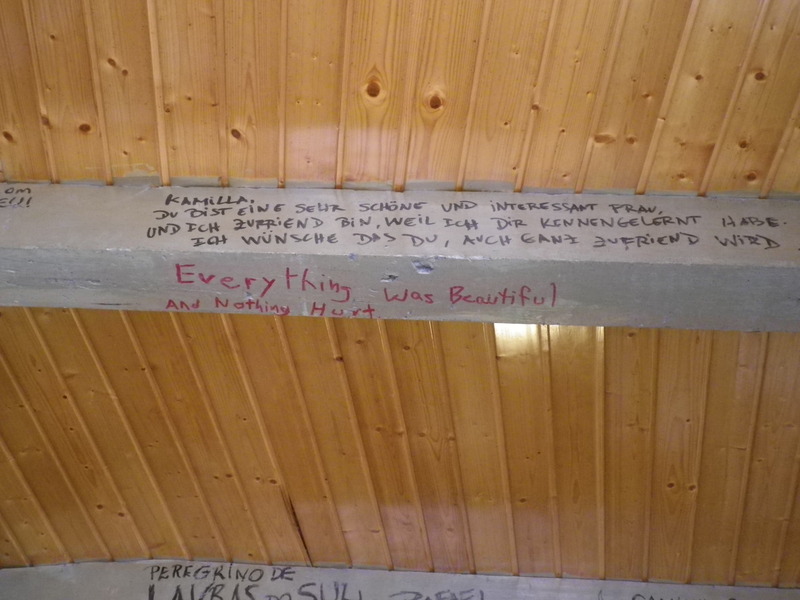 There were messages in many languages on the walls, the ceiling, behind the counter. The rafters – how did the writers get up there? All with different dates, handwriting, pens. It was surprising how profound people were, especially when seen through the lens of someone just coming off the road after days of journeying. There were flags from many countries. Had people thought of bringing flags with them? Who? Why? The music on the radio changed from Elvis rock-a-billy to Mexican Mariachi. 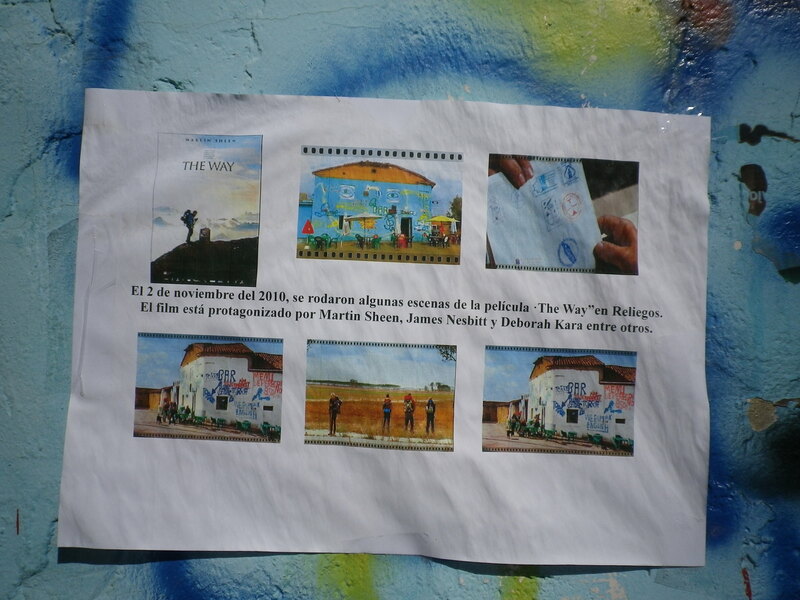 Stills from the movie, The Way, posted on the wall in a place of honor. 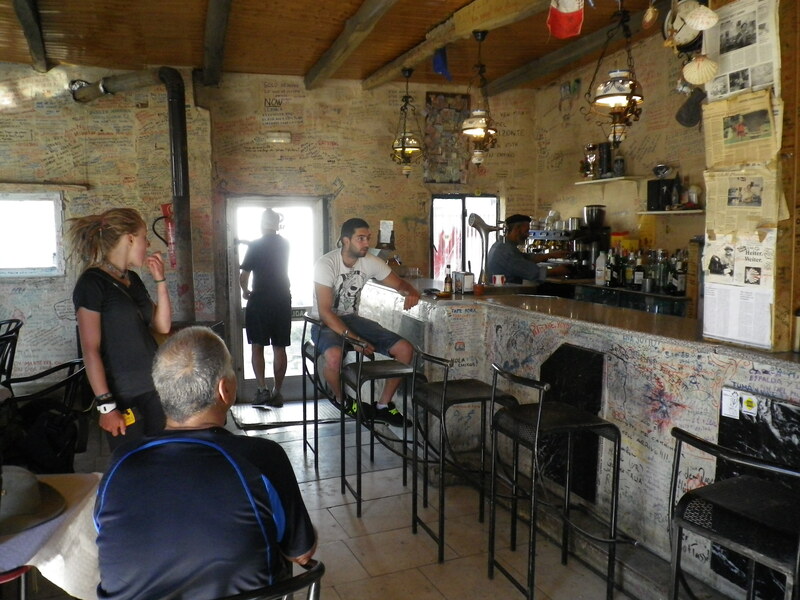 This place, the Bar La Torre, is proud that it was used in the movie, The Way, and Sinin cheerfully displays photos from the scenes it is in. 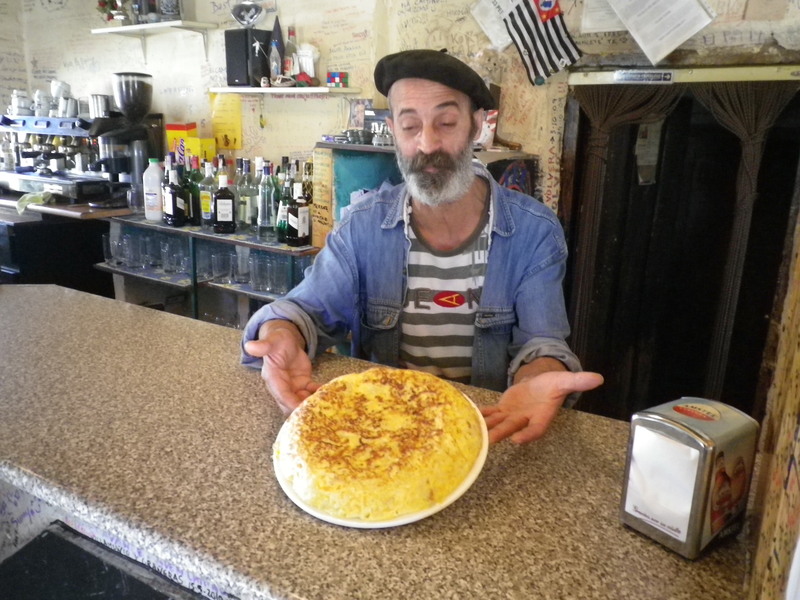 But nowhere does he mention that he makes the finest tortilla on the Camino. Did he add cheese? Was he shredding the potato? What was giving the tortilla height without making it heavy like a doorstop? I couldn’t answer these questions as I devoured the food and drank the cold beer, and still cannot. But this tortilla became my gold standard. It became the tortilla to which all other tortillas would forever be measured against. And my quest to discover the secret ingredient or technique would begin that day. My family will have to endure many tortillas in the coming days, months, maybe years, until I discover Sinan’s secret. I am a woman obsessed. I will not rest until I have cracked the code. This entry was posted in camino de santiago de campostella, Spain, Travel and tagged Camino de Santiago de Campostella, food, Spain, Travel, women hikers. Bookmark the permalink. Allyson, I’m all in flavor . . . er, favor . . . of that. Hi Kathy, my name is Margaret from Southern California. I leave for the Camino on September 1st. So excited for this adventure. I have been following your blog and now I can’t wait to try this tortilla. Thank you for all your insight. Margaret, you are going to have such a wonderful adventure. Congratulations – I’m very excited for you. Let me know if you need any advice or anything. Remember, it’s just walking. It may be tougher than you anticipate, but millions have done it before you. Hi Kathy, my only lingering issue is about communicating back home. Should I take my smartphone and get a Spanish SIM card or buy a phone card. There are so many different opinions on this and my head is spinning. As, I am not the most technical person. Any suggestions would be appreciated. Thank You! Hey, Margaret. I spent lots of time trying to decide how to stay in touch with family, also. I decided to take a smartphone. Is your phone “unlocked?” If you aren’t sure, go to a place that sells your phone and ask them. They can tell you in an instant. If it is unlocked, you are good to go. If not, your options are more limited. Once I got into Spain, I bought a Spanish SIM card and swapped it with my regular card (my phone is unlocked so I could do this). It meant I could make calls in Spain without them being seen as international calls (save money). Of course, the messages you’ll get from the phone company as they connect your new SIM card will all be in Spanish. For me, it was disconcerting since I couldn’t read Spanish very well. But, I could always ask any pilgrim on the Camino if I needed help. Most of the time, however, I just ignored the messages and made calls as I needed them, no problem. You can always just buy a pay as you go phone once you get into Spain if you don’t want to hassle with a SIM card (the card was not expensive) but I don’t have information on how that worked out, since I didn’t do it. I am very untechnical, also. In fact, I had just purchased the smartphone two weeks before my trip – I traveled with a cut-down version of the phone manual with me, LOL!! You may not be able to do the phone adjustment thing in every town or village – you have to wait until you get to a fairly large town or city. Where are you starting from? Kathy, this is Anne from Australia. I have been following your blog with interest. Seems like you are savouring every moment and describing beautifully your Camino experience. I love reading of your sights, sounds and culinary treats. How wonderful for you. I leave in 6 weeks to walk from Leon. Time constraints don’t allow any more. Leon is a good place to start. I understand about time constraints. Besides, you’re traveling from Australia! That is certainly part of the adventure! There are some great things to see and do along the way, be open to everything. Please let me know if there’s anything I can help you with. Ah, those Spanish tortillas! When I was in northern Spain my niece’s husband, a native Spaniard, made us one of these for dinner – the Best! My friend watched his every move and took notes; maybe we could start a whole new restaurant craze with this wonderful dish!